Parrot species like the Hawk-Headed Parrot is just one of a whole bunch of fun and interesting pet parrots! Whether you are looking for a good pet parrot or an aviary companion, there are many different types of parrots to choose from. There are about 372 parrot species from around the world. The greatest diversity of parrots are found in Australasia, Central America, and South America, but there are some very unique birds from other regions as well. The bird guides included here are a sampling of some of the other interesting parrot types. These are more individual or unique types of parrots. They don't necessarily belong to some of the larger and/ or more readily known groups of parrots. Yet some of these very unique birds are at the top of the list as all time parrot favorites! for bird guides on each Parrot species. Parrot Origins Parrot species are also known as psittacines. They are come from around the world, found in tropical and subtropical regions as well as temperate regions of the southern hemisphere. The greatest diversity of parrots are found in Australasia, Central America, and South America, but there are some very unique birds from other regions as well. The first parrot types are believed to have originated in Europe, determined from a fossilized wing bone found in Denmark and dated at about 54 million years ago. This is followed by complete skeletal fossils of parrot-like birds found in England and Germany, and dated at about 50 million years ago. Yet rather than direct ancestors of the modern parrot, are believed to be related lineages that have since died out. Parrot Keeping History Our romance with parrots and keeping them in captivity has a very long history. Literary descriptions and illustrations can be found dating back more than four centuries. Trade vessels of early days allowed Seafarers to visit Asia, Africa, South America, and Australia. Adventurers not only described these beautiful birds, but captured and brought them to Europe. 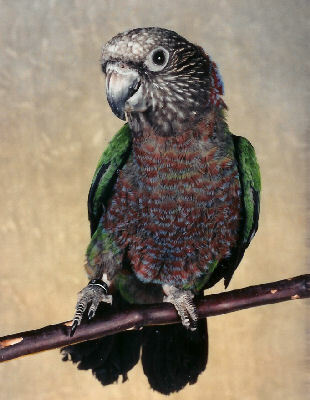 The Greeks and Romans, prior to the time of Nero, are described as having Ring-neck Parrots from India referred to by Aristotle as "The Indian Bird". The greatest amount of knowledge about parrots was gained during the 19th century by European explorers. They had strong natural history interests. Much of the exploration of the time was devoted to learning not only about birds, but also other creatures, and flora and fauna as well. Travel and trade began to bring many species to the United States from Australasia, Asia, India, Africa, and South America. There is an interesting photo of Theodore Roosevelt, Jr. posing with his pet Hyacinth macaw "Eli" in the White House Conservatory, it was taken in 1902. Pet Parrots Today Throughout the 1900's, the parrot keeping hobby would grow and decline. This was due to several periods where importation was followed by bans. In the 1920's and again in mid-century there were bans were due to bird diseases, like psittacosis which was called "Parrot Fever", and more recently import restrictions. Today most pet parrots are bred in captivity. The Convention on International Trade in Endangered Species (CITES) has banned the sale of imported wild caught birds. But due to their long lives, you could still find yourself with an originally wild caught parrot if you adopt an older bird.